Due to Easter and the interruption with the public holidays, the Social Media Marketing Institute has decided to extend the Call for Entries for the 2019 Social Media Marketing Awards until 30th April 2019, 11.59 AEST. Entries need to be completed by this date to be considered for judging. The early bird Call for Entries for the Social Media Marketing Awards close today at 11.59pm. The early bird entry fee is only $149 inc GST. And the best news is you don't have to submit your entry until 24th April 2019. All you need to do is make payment to lock in this great price. And 10% of your fee will go to the Starlight Foundation's Livewire program. Make sure you take advantage of this great price before it goes up $100 per category. If you have any question, please do not hesitate to email awards@smminstitute.com.au. We look forward to you being a part of the social media industry's premiere event. Thanks to GM Sounds for our awesome awards music!!!! *please note that the Social Media Marketing Awards are only open to Australia and New Zealand. We are excited to announce that the Call for Entries for the Social Media Marketing Awards has opened for 2019. It is a great chance for individuals, businesses, companies, organisations and not-for-profits to be recognised for the outstanding job they do in the social media space. Plus our other 15 categories. We have an esteemed panel of judges from all over the world who are looking forward to evaluating all the entries. To enter, just go to https://www.socialmediamarketingawards.com/enter/ and follow this directions. There is an early bird entry fee of $149 inc GST available between 15th January 2019 until 15th February 2019. From the 16th February 2019, the normal entry fee of $249 inc GST will apply. 10% from each entry fee will go to the Starlight Foundations LIVEWIRE program. livewire.org.au connects teens and young people (10-20) experiencing serious illness or disability, through a safe online community. It helps teens navigate life with a serious illness, support each other and most importantly, to focus on the positives of what they can do, not what they can’t. The Call for Entries for the Social Media Marketing Awards for 2018 has closed. We have received so many entries and they are of a very high calibre. We are currently reviewing all the entries before passing them on to the judges to review. The judges will have the month of May to complete their judging using our online awards platform. They judge independently and do not see the scores from other judges. We will be announcing the Finalists on June 6th 2018. All entrants will receive an email that day advising them of the list of finalists for each category. All entrants will receive a Nominee badge for each category they have entered before the end of this week that they can use on websites, social media and marketing materials. 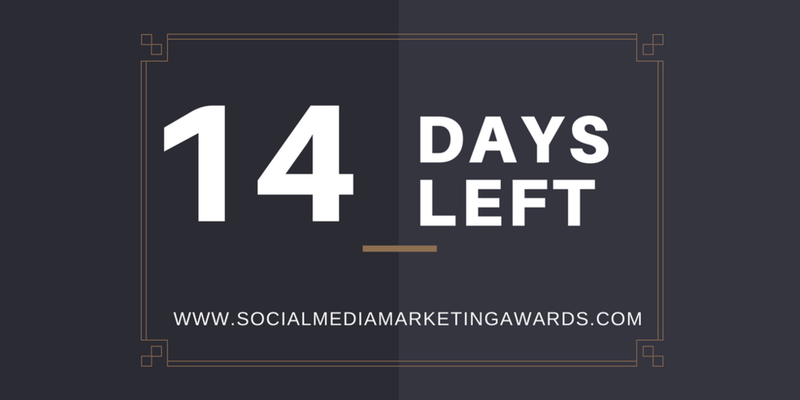 We are in the home stretch for entries for the Social Media Marketing Awards. Entries close at 11.59pm TONIGHT, 30th April 2018 AEST. Work on them early so you have plenty of time to complete your entry. There is nothing worse than feeling the stress as 11.59pm gets close. I know this from personal experience. Enjoy the process - Take a little time to celebrate the great work you have accomplished. We generally do not take time to celebrate our wins so this is a chance to reflect on all the awesome work you and your team does. You can turn your entry into a case study that you can use for your own marketing. The judging process will commence tomorrow and the judges have the whole of May to finalise their judging. Finalists will be announced on June 6th 2018 and we will be sending confirmation to all entrants via email on that date. The nominee badges will be emailed out to you for each category you have entered before the end of this week. I am available all day to answer any questions you might have on either 0412 304 535 or on email at mireille@smminstitute.com.au. Thank you so much for all the entries we have received so far for the Social Media Marketing Awards! We are so excited to see the calibre of entries we have received. We have received feedback that people need a few extra days to ensure they are able to finalise their entries so we have decided to extend the entry deadline to Monday 30th April 2018 at 11.59pm. This will give entrants another 6 days to gather their evidence to add to their awards. If you have any questions, please do not hesitate to contact Mireille Ryan on 0412 304 535 or email mireille@smminstitute.com.au. I just wanted to send a reminder to you to let you know it is only 2 weeks until the Call for Entries closes for the Social Media Marketing Awards - on Tuesday, April 24th, 2018. I can tell you - winning an award is a big deal for your career! I won an industry award in 2010 and it was life changing. It attracted lots of new clients. I was featured in newspapers and magazines all over the world. I was invited to speak at conferences. I was asked to write for several magazines. And even though I have changed industry, being an award winning entrepreneur still brings me benefits 8 years later. And the scary thing was, I almost didn't enter. I remember thinking that I didn't think I would win. I was so busy and almost left entering until it was too late. I am so glad I listened to that inner voice that said to just give it a go as there was nothing to lose. Imagine what I opportunities I would have missed out on. Make sure you enter the Social Media Marketing Awards today. The countdown is on - only a month until the Call for Entries close for the Social Media Marketing Awards. Imagine what it will be like to stand in front of the leaders of the Social Media Industry and accept an award. I know how it feels to win an award. In 2010, I won an Australian Exercise Professional of the Year and that moment was life changing. As soon as I sat down after accepting my award, people started coming over to me and wanting to collaborate. I was in magazines and in the news - it really allowed me to gain visibility. I was invited to speak at conferences. Even though that was 8 years ago and I have changed industries, it still brings me benefits. This is why I was passionate about creating an Awards Program exclusively for the Social Media Marketing Industry. 1. Know your dates - The key date is April 24th, 2018 and you need to have finalised your entry and paid the fee for entry (if you are not a member of the Social Media Marketing Institute). That might seem a long way off but it is not as far away as you might think. Don't put yourself under pressure by trying to put together your Award entry on the due date. 2. Make sure you understand the judging criteria for the category you are entering. Look at how the judges will mark the category you are entering and ensure you address them in your entry. 3. Look at what supporting material you can provide to enhance your entry. It could be a video, images or screen shots from your social media. 4. Get permissions if required - if you are from an agency or do social media work for clients, you will need to ensure you get their permission to enter the campaign. A joint entry is a great way to celebrate an awesome collaboration. 5. Put together your entry on a word document and transfer the information into the Awards portal. I have learnt that this is good practice and a way to ensure you minimise frustrations, especially as you get close to the due date. We have an excellent Awards portal but computer glitches and even blackouts can cause frustrations and you don't want to perfect that entry to then lose it. And yes, it has happened to me so I speak from experience. 6. Check spelling and grammar - This can sometimes be overlooked as you finalise your entry. Run your entry through a grammar program or ask someone else to proofread your entry. Sometimes you can read something a dozen times and still miss a simple mistake. 7. Have a couple of people proof read your entry - If you feel you are ready to submit, ask someone else in your business or agency to read through the entry to ensure you have answered the questions and included the best information to make you entry stand out from the rest. If you work for yourself, ask a business mentor or a friend who really knows your business to give you some feedback. It is amazing what a fresh pair of eyes can see. 8. Make sure any figures in your entry can be backed up - If your entry refers to results achieved by your campaign, these will need to be backed up and judges will ask for them if they are not included in your entry. 9. Enter multiple categories - Once you enter your first category and make payment, you will receive a membership to the Social Media Marketing Institute and once a member, you can enter as many award categories at no further charge. By entering multiple categories you increase your chance to be named as a finalist. You will also receive a nominee badge that you can put on your website, social media and marketing materials. 10. Enjoy the process - This is a chance to put together a great case study for your business so take the time to enjoy the successes you have had and celebrate what you have achieved. If you have any questions at all, please email me at mireille@smminstitute.com.au or call me on 0412 304 535. The Social Media Marketing Awards Gala Dinner will be huge and we look forward to you being a part of it! The Social Media Marketing Awards are open to individuals, agencies, brands, companies, non-for-profits and organisations that participate in social media marketing. Entries must have been created and been live on social media in the 12 months up to April 24 2018. Entries are currently only being accepted from Australia and New Zealand. Entry is free for members of the Social Media Marketing Institute. For those who are not members, the early bird entry deadline, with reduced fees, is 1st December 2017. The entry fee also includes a membership to the Social Media Marketing Institute. Once a member of the Social Media Marketing Institute, entrants can enter as many awards categories as they wish at no further cost. The final entry deadline is April 24 2018. Winners of the Social Media Marketing Awards will be announced at a gala awards banquet on August 16th 2018 in Sydney. The 2017/18 program offers new categories and will be judged by the leaders in social media industry. Proudly presented by the Social Media Marketing Institute, the Social Media Marketing Awards (SMMA) honours and recognises individuals, teams, agencies and organisations, to celebrate excellence and achievement in social media marketing. It is an opportunity for public and peer recognition for leaders in the social media marketing industry. Tip 2: Write concise and compelling summaries - you only have limited words in which to address the criteria so make sure you are concise and to the point. Structure your entry. Tell a story. Tip 4: Clearly State the Results - The results are an important part of the judging criteria so be specific. For example, what was your increase in followers, what was your engagement, what was your reach, what was the ROI, what was your increase in revenue? Tip 5: Stick to the Word Counts - Judges have lots of entries to review so please stick to the word count. If the word count is 500, any additional words in that section will not be included. Tip 6: Provide the Evidence - If you are entering an award that requires testimonials, campaigns, videos or images, don' forget to include them. Tip 7: Have your Entry Proof Read - sometimes you can look at something many times and not see errors. Ask other people to proof read and offer feedback for your entry. Make sure you allow plenty of time for this process so you do not miss the entry deadline. Tip 8: Make Sure You Have Approval From Clients - if you are submitting an entry on behalf of a client, make sure you get approval from them first. Ensure you have them fill our a Client Permission form and submit it with your entry. Tip 9: Fill out your Entry on a Word Document Before Transferring it to the Online Entry Form - you don't want to spend time writing an awesome entry, only to have the web page crash when you submit it. Tip 10: Allow Plenty of Time to Submit Your Award Entry - Make sure you have included all your information and evidence. Don't put pressure on yourself and wait until the last minute. You will not submit your best entry under pressure.